Carotid stenosis is a narrowing of the lumen of the carotid artery, which is located at the sides of the neck. 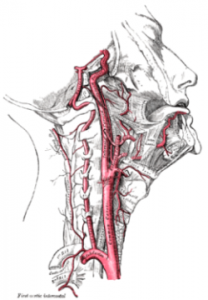 Common carotid artery branches into the two main arteries: External and Internal Carotid artery, which are responsible for vascularization of the face and the brain, respectively. The common cause of carotid stenosis is atherosclerosis (plaque build up on the arterial wall) which causes decrease in blood flow and ischemia. Atherosclerotic plaques can be stable, when they are clinically silent (there are no symptoms) and unstable when there is a danger of disruption of a plaque with a possible thrombotic occlusion or embolisation. Clinical states associated with unstable atherosclerosis can manifest as: TIA (Transitory Ischaemic Attack) and thromboembolic stroke. Stenting is a procedure which uses a small tubular device, often called an endoprosthesis, which provides support to blocked blood vessels. It acts as a scaffold to reinforce the wall of the vessel and prevent it from closing down. 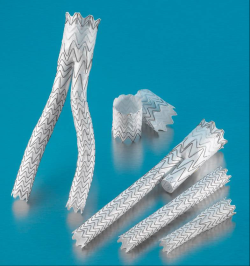 A stent is most often made of medical grade metal or plastic and can be used to treat many different conditions that cause narrowing or obstruction to vessels and tubes in the body, such as plaque, scar tissue or cancer. Angioplasty is a minimally invasive medical procedure designed to unblock clogged or narrowed blood vessels, most commonly an artery. The procedure is performed under local anaesthetic and sedation by an interventional radiologist, a highly trained specialist medical practitioner. The affected blood vessel is dilated with a very small balloon attached to a catheter, which is inserted into the blood vessel via a tiny skin puncture the size of a tip of a pen. The balloon is kept inflated for a short while, and then deflated and the catheter is removed.